Last week I spent the day planting pots with my mom and her sisters. 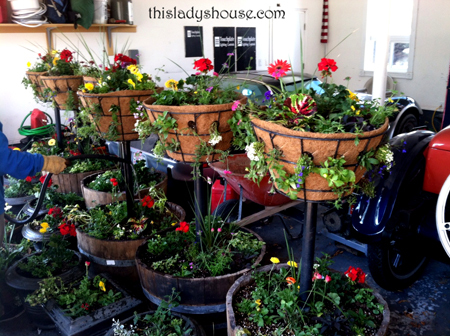 We planted over 60 different pots to be used at our homes and our husbands businesses. Although it is still too cold for the pots to live outside I am always glad to have my container planting done for the summer! Planting so many pots all at once led me to thinking about all of the creative things I have seen people use for their container gardens. Here are a few fun ideas for planting! Plastic Bottles: Use up all those old plastic bottles kicking around. I love the idea of planting something that trails so the bottle is mostly hidden! If I am unable to figure out a good alternative I may be filling my front planter with annuals, which I’m afraid won’t do well because it doesn’t get a great deal of sun. In summary I need a low profile perennial plant that flowers for a long period of time and doesn’t require a lot of sun. Maybe I’m asking too much? Any suggestions? 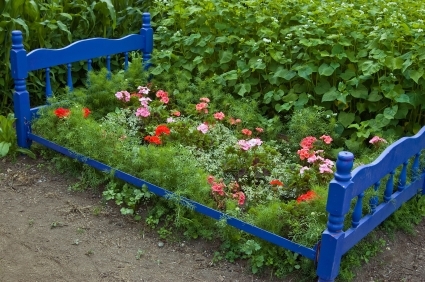 Bed: Nothing says ‘bed of flowers’ like an actual bed. I love the bright blue color the beautifully compliments the green foliage! 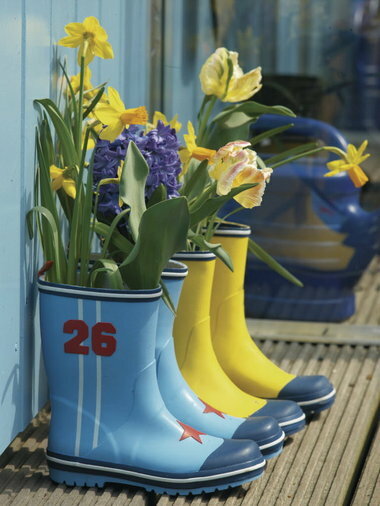 Boots: Who doesn’t love a great pair of brightly colored rubber boots? 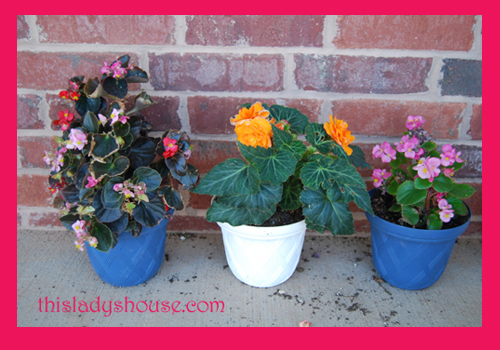 Tulips in the spring and annuals in the summer would make a great addition to your front porch in a fun set of boots. 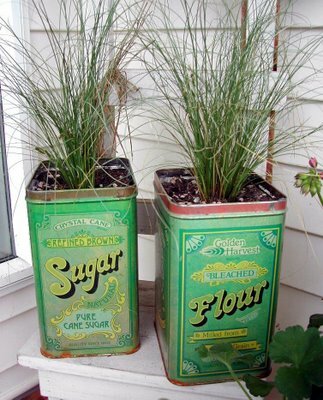 Metal Cannister: I love the antique feel these cannisters give a freshly planted flower. 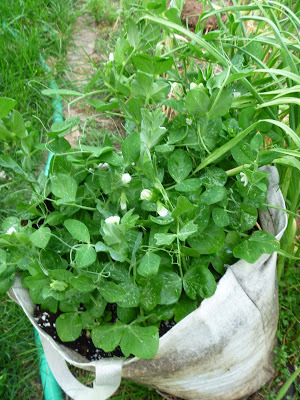 Canvas Bag: Love that this bag of Peas looks like it is all ready to be picked up and taken somewhere important. I’m not sure where a bag of peas needs to go but it sure does look great! 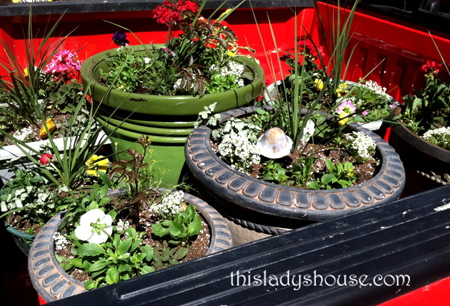 Container gardens can be made from just about anything! Old cars, tubs, boxes, bags or tree stumps. The possibilities are endless!! This entry was posted in In the Dirt and tagged Flowers, Gardening.